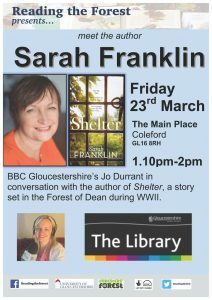 A chance to meet Sarah Franklin, author of Shelter – a story set in the Forest of Dean during WW2, featuring lumberjills and Italian POWs – presented by Reading the Forest, which is part of the Foresters Forest Heritage Lottery funded program currently happening across the Forest of Dean. Following the Meet the Author session in Coleford Library, Sarah will lead a workshop from 2.30 – 4.30 pm in The Main Place on How to Write Book Reviews. It’s all free but you have to book – please contact Michelle Goodfield by email at forestersforest@fvaf.org.uk or call 01594 822073 at FVAF Office Cinderford (Mondays 9.30am – 3.30pm). Costa Short Story Awards judge.